It's been incredibly hot here the past few months, and even I, who's heart is usually aching for warm weather, am finding myself dreaming of early Fall. The intense heat has affected the growing season in our state, especially for backyard growers like us. Our tomatoes, peppers and basil are the only things that survived, all of our other plants are long gone. No amount of watering can compensate for the prolonged triple digit temperatures we're experiencing and all we can do is sigh, and be patient in awaiting rain and cooler weather. It's been tough, to say the least. By the time the sun is setting, we are craving the outdoors. After dinner, the four of us hurry outside to watch the sun set on our porch and I chase Andreas and Lucía around with my camera. As the blue sky turns orange and the gentle breeze blows through my hair, I think about how thankful I am for simple things like a small drop in temperature, my camera, and the joy in capturing those moments with my children. We've also spent a lot of time over at my parents', which is sweet. Andreas' bond with them has grown stronger by the day and I can't say that I've seen much more endearing to me than that. It warms me to the core, each time he tells me how much he loves them. So, while I am sad that he can't play outside much during the day, I'm happy that he's been able to play with his Grandpa and Grandma more than usual. In lieu of cooking big meals, my Mom and I have just been putting simple salads together and grilling our protein. The last thing we want to do is heat up the house, so cool salads are perfect. I bring over tomatoes from our garden, and she throws in whatever veggies she found at the farmers market that week. One thing is always the same, though : the dressing. It's one we've used for years and it's oh so characteristic of my Mom's recipes - incredibly simple. Of all the things I'm thankful for in life, inheriting my Mom's sense of simple eating is surely somewhere at the top. I adore the way she cooks. This is the way she always dresses a salad, and it's just three simple ingredients. Lemon juice, olive (or grapeseed) oil and garlic. If you're used to complicated dressings from a bottle, you probably won't believe how delicious this one is. I've served it to many a guest in this house, and never once encountered anything but pure delight. It's light, refreshing, and delicious. One of my absolute favorite things, when drizzled over a bed of greens. I think you'll fall in love with it, too. Oh, and a quick summer snack we've been enjoying...garden tomato sandwiches. Just slices of fresh tomato, good mayo (preferably homemade), dijon, lettuce and cracked black pepper between two slices of toasted sprouted bread. It's a good way to use your Summer tomatoes and also avoid using your stove. Give them a try! Begin my mincing the garlic very finely. Juice the lemons and whisk in the garlic and about 1/2 cup of oil. Salt to taste (1/4 teaspoon or so). Drizzle over a bed of greens and veggies, and enjoy. note : if you don't have lemons on hand, raw apple cider vinegar is a good substitute. 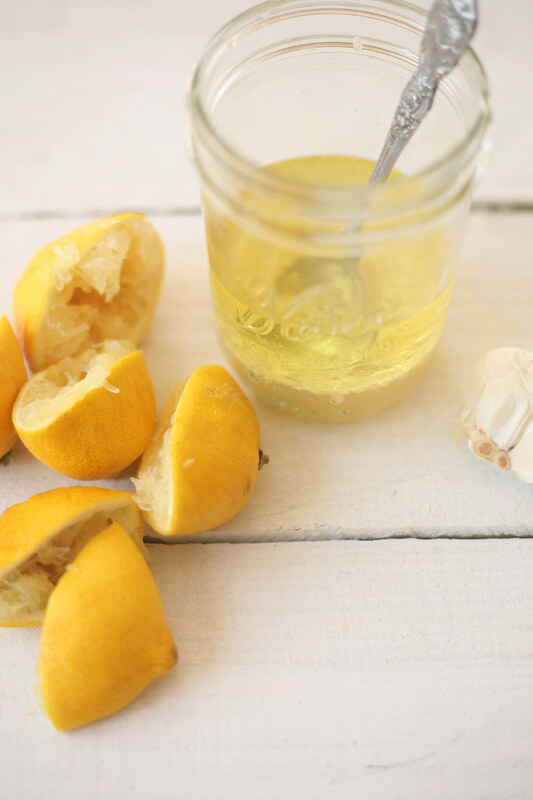 Or for a slightly different flavor, you can even add a little bit of apple cider vinegar to the lemons. Beautiful post, very evocative. I'll definitely be trying your salad dressing! I stumbled across your beautiful blog and gorgeous pictures of food. I love to take pictures of what I make to eat, but they hardly compare to yours! Thanks for sharing your recipes! My goddaughter is named Lucia, what a beautiful name. Pure, fresh-squeezed lemon juice is the only thing I put on my salad anymore. So yummy! Thank you for showing me how to switch it up a bit. I'm gonna try it now!